What In Your Trash Today? Regular readers of The Earth is not a Trash Can know that Thursdays are trash day in my neighborhood. I run every Thursday morning, and my favorite diversion is to see what people throw into their trash cans. * In Lexington Point, I saw two couches and a potted tree (still alive) put out by the trash cans at three houses. 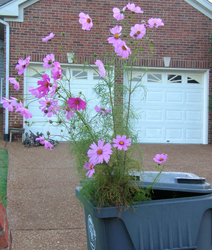 On my street, I saw these flowers in the trash can of a neighbor last night. This morning I noticed that they were still beautiful and photographed them. Similar flowers, which didn’t look so beautiful, were still growing in the yard. *I don’t prowl. I’m not a freegan. I just observe what is stacked by the trash cans or what is sprouting from the lids. Stranger Than Truth. I just overheard Campbell Brown say that there is a fog machine at a Sarah Palin rally in Ohio tonight. She doesn’t need that. I didn’t notice her mustache on the Newsweek cover until Fox News pointed it out this morning. Every woman over 40 has a mustache. Newsweek Asks: Who's the Greenest of Them All? Then, you open to this unique Target ad. I’ve never seen Target advertise in Newsweek. 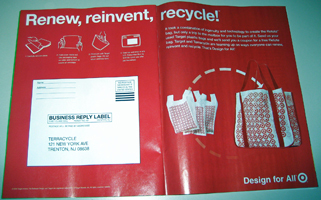 Target is promoting its reuseable Retote (trademark) bag. According to the ad, tear off the Newsweek cover. Fold as instructed, stuff with Target plastic bags and fill out the return address. Seal and mail. Then you’ll receive your Retote (trademark) bag in the mail. Due to the men’s and women’s Final Four tournaments this week, I haven’t read the magazine to discover who is the greenest of all–Barack, Hillary or McCain. But speaking of plastic bags, I read this interesting article today on the internet…. Newsweek Asks: Who’s the Greenest of Them All? And whether he’s building new homes or renovating old ones, he insulates them to the hilt, uses sustainable materials and recycles so much debris that he requires only the smallest Dumpsters.